During the Middle Ages the Christians of Europe used to go to the Holy Land for the purpose of visiting the tomb of Christ and other sacred places. Those who made such a journey were called "pilgrims." Every year thousands of pilgrims, kings, nobles and people of humbler rank, went to the Holy Land. While Jerusalem was in the hands of the Arabian caliphs who reigned at Bagdad, the Christian pilgrims were generally well treated. After about 1070, when the Turks took possession of the city, outrages became so frequent that it seemed as if it would not be safe for Christians to visit the Savior's tomb at all. About the year 1095 there lived at Amiens France, a monk named Peter the Hermit. Peter was present at a council of clergy and people held at Clermont in France when his Holiness, Pope Urban II, made a stirring speech. He begged the people to rescue the Holy Sepulchre and other sacred sites from the Mohammedans. The council was so roused by his words that they broke forth into loud cries, "God wills it! God wills it!" "It is, indeed, His will," said the Pope, "and let these words be your war-cry when you meet the enemy." Peter listened with deep attention. Immediately after the council he began to preach in favor of a war against the Turks. With head and feet bare, and clothed in a long, coarse robe tied at the waist with a rope, he went through Italy from city to city, riding on a donkey. He preached in churches, on the streets, wherever he could secure an audience. When Peter had gone over Italy he crossed the Alps and preached to the people of France, Germany, and neighboring countries. Everywhere he kindled the zeal of the people, and multitudes enlisted as champions of the cross. Thus began the first of seven wars known as the "Crusades" or "Wars of the Cross," waged to rescue the Holy Land from the Mohammedans. 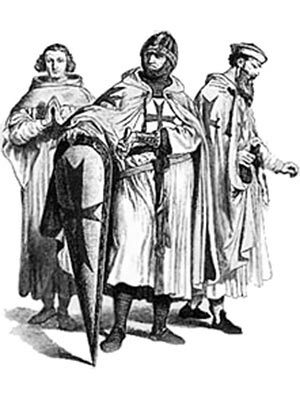 It is said that more than 100,000 men, women and children went on the first Crusade. Each wore on the right shoulder the emblem of the cross. Peter was in command of one portion of this great multitude. His followers began their journey with shouts of joy and praise. But they had no proper supply of provisions. So when passing through Hungary they plundered the towns and compelled the inhabitants to support them. This roused the anger of the Hungarians. They attacked the Crusaders and killed a great many of them. After long delays about seven thousand of those who had started on the Crusade reached Constantinople. They were still enthusiastic and sounded their war-cry, "God wills it!" with as much fervor as when they first joined Peter's standard. Leaving Constantinople, they went eastward into the land of the Turks. A powerful army led by the sultan met them. The Crusaders fought heroically all day long but at length were badly beaten. Only a few escaped and found their way back to Constantinople. Peter the Hermit had left the Crusaders before the battle and returned to Constantinople. He afterwards joined the army of Godfrey of Bouillon. Godfrey's army was composed of six divisions, each commanded by a soldier of high rank and distinction. It was a well organized and disciplined force and numbered about half a million men. It started only a few weeks after the irregular multitude which followed Peter the Hermit, and was really the first Crusading army, for Peter's undisciplined throng could hardly be called an army. After a long march Godfrey reached Antioch and laid siege to it. It was believed that this Moslem stronghold could be taken in a short time; but the city resisted the attacks of the Christians for seven months. Then it surrendered. And now something happened that none of the Crusaders had dreamed of. An army of two hundred thousand Persians arrived to help the Moslems. They laid siege to Antioch and shut up the Crusaders within its walls for weeks. However, after a number of engagements in which there was great loss of life, the Turks and Persians were at last driven away. The way was now opened to Jerusalem. But out of the half million Crusaders who had marched from Europe less than fifty thousand were left. They had won their way at a fearful cost. Still onward they pushed with brave hearts, until on a bright summer morning they caught the first glimpse of the Holy City in the distance. For two whole years they had toiled and suffered in the hope of reaching Jerusalem. Now it lay before them. But it had yet to be taken. For more than five weeks the Crusaders carried on the siege. Finally, on the 15th of July, 1099, the Turks surrendered. The Moslem flag was hauled down and the banner of the cross floated over the Holy City. A few days after the Christians had occupied Jerusalem Godfrey of Bouillon was chosen king of the Holy Land. "I will accept the office," he said, "but no crown must be put on my head and I must never be called king. I cannot wear a crown of gold where Christ wore one of thorns nor will I be called king in the land where once lived the King of Kings." Peter the Hermit is said to have preached an eloquent sermon on the Mount of Olives. He did not, however, remain long in Jerusalem, but after the capture of the city returned to Europe. He founded a monastery in France and within its walls passed the rest of his life. Some interesting facts and short biography information about the History, Life & Times of Peter the Hermit. Additional details, facts, history and information about the famous people of the Middle Ages and important events during their times can be accessed via the Middle Ages Sitemap.